When you get the opportunity to go on a GIRL’S VACAY to Mexico….well you do everything to make it happen! And if you want a quiet and cozy place to stay, then the Hotelito a charming and colorful little B&B would be a great choice! But first…..let’s start from the beginning! I woke the morning of my departure with SO MUCH EXCITEMENT knowing that I was going to be able to be with my two amazing girlfriends, SheShe and Jamie! I’ve traveled with them before to Santa Fe, and there’s an uncanny connection between the three of us! I first met Jamie in Salt Lake at the airport so we could fly to Mexico together. Sitting right behind her, it was fun putting together our stories leading up to meeting up with our third girl, SheShe. When we arrived, we met Uncle Clark and anxiously drove with him to the Hotelito to meet SheShe……..and what a reunion it was! We were giddy and SO EXCITED for our adventures with the most GORGEOUS and ACCOMMODATING Nina, from The Paradise Story. If YOU want an INCREDIBLE custom-made vacay…..Nina is your girl! Oh my heavens, the way she catered to us was unbelievable! She was there to meet us as well and the sweetest vacay coordinator she is! We all fell in love with Nina! Nina started her business two years ago because of her love of adventure! She’s got connections everywhere and so much knowledge to share about her destinations. There’s no question how passionate she is with what she does! She LOVES to share this with others! We had the BEST time with her! Most of our days with Nina were spent taking pictures, site-seeing, exploring, and eating! She planned in for us to have a couple hours during SIESTA time each day to catch up on our work! But Hotelito was such fun to just hang out at. The pool area was beautiful, the colorful walls charming, the hammocks on each of our patios so comfy, the food delicious, and then there was Jenny who is the owner. She was a delight with her European accent and attention to detail! The workers on the property were so personable and there to assist in any way! I could have spent a week just there at Hotelito taking pictures! Just amazing!!! One of the really cool things about Hotelito which we all loved, was that they have a great LOVE for abandoned animals, and their rescue efforts are incredible there. Each of these rescued animals come from really painful backgrounds, and have found a home with Jenny and her staff there on the property! There are horses, pigs, donkeys, goats, dogs, and cats who have found a safe haven with lots and lots of LOVE and ATTENTION! They love for the guests to come and visit! It’s really very sweet!!! The “HONESTY BAR” there, is a cash only donation bar, with the funds going towards the costs of maintaining the animals! Hotelito is offering you a 10% discount if you book before December 31st. Subject to availability of course and for your stay from January 5th forward. This is such a fabulous way to stay in Mexico, as it’s so quiet and intimate! Perfect for a couple’s getaway! We LOVED our time at the beach taking photos, hiking and exploring, and one of our favorite activities was going and watching the migration of the turtles! The beach was full of onlookers waiting for them to be washed up on to the sand. All I kept thinking was how much my grandkids would LOVE this!!!!!! Nina had a drone one day and we had such fun romping in the sand posing for our overhead pics! We all want our own drones now! It was so cool to see the wild horses running along the water and then in to the jungle!!!! The morning we left Hotelito, Nina had arranged for us to get a massage! It was HEAVEN! It was so needed and such a relaxing morning! We said our goodbyes and our THANK YOU’S to Jenny and her staff with such gratitude for an incredible stay at Hotelito. We can’t wait to go back. When you go to Mexico you absolutely need a swimsuit and we were lucky enough to wear Lime Ricki! The quality in these suits is unmatched, nice fabrics and on the NON-FLIMSY side! This one I felt more confident in than a lot of suits I have, simply because of the weight of the fabric! I also talked about Lime Ricki here. We each brought with us our MBK Beauty Devices to keep our skin looking fresh. These devices are so good to have in our arsenal of skin health! Each of us are very attentive to the health of our skin, and take time each morning and evening to pamper ourselves! And MBK helped us do just that!!! Thank you MBK for keeping us looking our best! I absolutely fell in LOVE with my beautiful tote from GiGi New York along with a makeup pouch, passport cover, and luggage tag. I LOVED the tote and took it everywhere! I’m still using it now that I’m home and am so impressed by the quality and design! It’s so comfortable and everything stays so organized inside! LOVE it! Thank you GiGi! I am a fan FOREVER!!!!!!!! Use code CHIC40 for 40% off ANYTHING on their site!!!!!! My favorite pajama store, SOMA, sent us each a pair of the most snuggly and comfy jammies to wear on our trip! If YOU want something soft to sleep in…these are it! I’m lucky enough to have several pair now, and there’s NOTHING like the fabrics! We had such fun in our SOMA style! These were mine and here, these were Jamie’s, and these were SheShe’s and here and here. Thank you SOMA! Soma also sent us our long sweaters and basic white tees to wear with our cutoff jeans. Each one was so comfy and such fun to wear with shorts! I also loved mine for the plane! It was just like being wrapped up in a blanket! These will be perfect now that we are dressing in layers this fall! And if you need a great basic white tee….Soma’s is awesome! It’s a little thicker than normal and drapes so nicely! CHICOS always goes with us on our vacations! 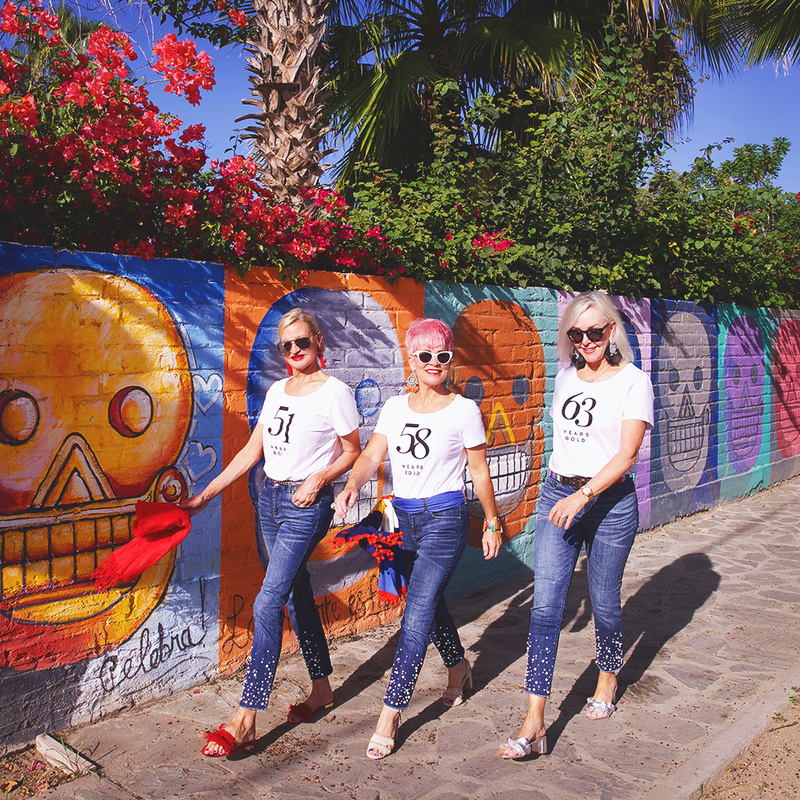 This time we had such fun with our PEARL jeans! I blogged about them right here and am so EXCITED to wear them during the holidays! So FANCY and SO FUN! We wore these sweaters with them. And then we just had to pack our AGE tees to go with our pearls as well! They also sent us our cute beach sandals too! Thank you always Chicos, for your support! We sure do LOVE you! And what about this new find of mine, COLOMBIAN MARKETPLACE?! We loved our swimsuit cover-ups or kimonos, but you know when you’re a fashionista you find multiple ways to wear a fabulous lace cover-up!!! A similar one is here. Yep, not only at the pool, but on a horseback ride along the beach! That’s right and they were gorgeous there too! 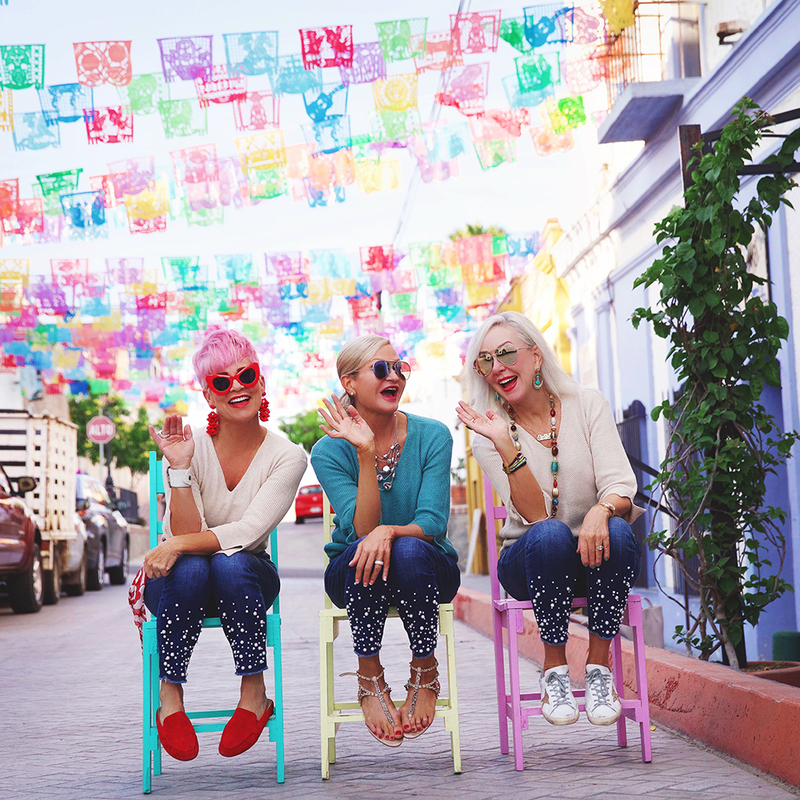 We definitely made them very versatile and just the perfect little number for Mexico! GrayC Glass is one of my favorite jewelry makers that I’ve met on Instagram. Courtney works so hard at her craft! She sent us these beautiful and adjustable GIRLFRIEND BRACELETS that went with so much of what we had! The pop of turquoise blue added such a fun touch to our STYLES!!! Thank you so much Courtney!!!!! We LOVED having them with us on our vacay!!! We were lucky enough to be able to take these pretty clutches from MODUSRIO! I loved the combination of linen and leather! You can find mine right here. I used mine multiple times and it was SO CONVENIENT and easy for dinners out at night. I loved the way it looked with this all white outfit I wore in front of the DAY of the DEAD wall, my favorite wall on our trip! You can read more about this celebration here. Another brand I hadn’t had the chance to work with, was Sylca. Their jewelry is so colorful and fun and went with the vibe in Mexico just beautifully! I LOVE my bracelet, and it’s so comfortable too! I wore it quite a bit on my trip, and have continued to since I’ve been home. It’s right here. Every fashionista will take at least one hat on her trip! And each one of us LOVES LOVES and LOVES our HATS! Now SheShe will takes multiples and wear them all on her head at once as she transports them to her destination….including through the airport! SheShe keeps us all laughing!!!! But we absolutely LOVED our hats from Tenth Street Hats. I’m not sure there was a day that went by that we DIDN’T have our hats on! We definitely put them to good use! Mine is right here. Lascana was a new brand for me to work with and I LOVED! These beach pants and tee are right up my alley, and not only on the beach, but at home lounging too! SheShe wore this darling jumpsuit and my pants and tee are here. 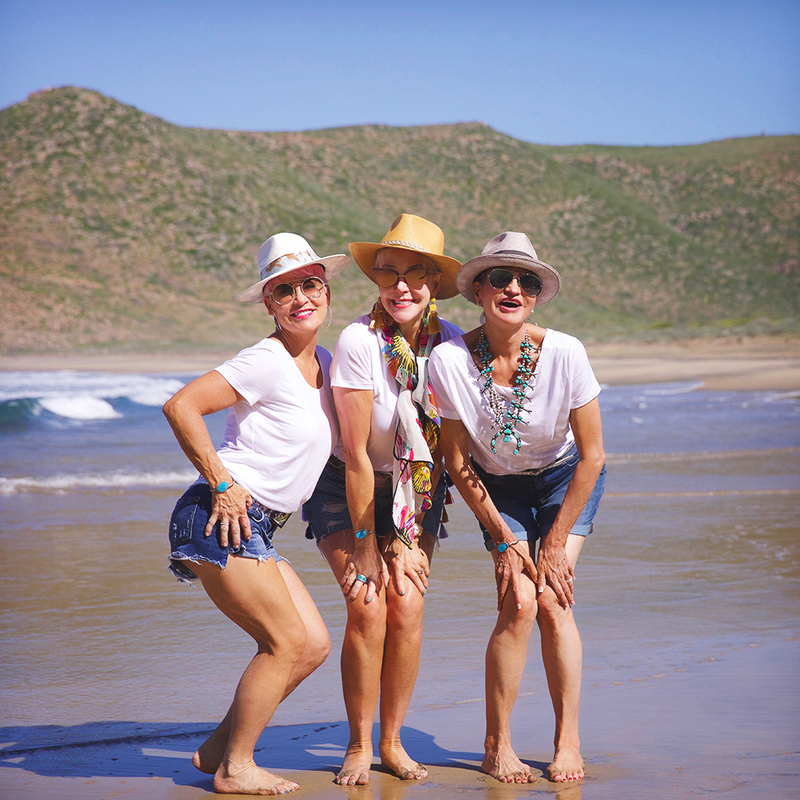 Thank you Lascana for our sassy beach style….we love your brand! Sharif sent us the most fabulous bags that fit in with EVERYTHING we had! We all loved our exquisitely made bags with incredible bead work! Aren’t they awesome?? Here we are wearing them with our Lascana outfits. This is my first Sharif, and I’ve become a fast fan! BEAUTIFUL bags!!! I’ve got much more to talk about with the 2nd half of our trip….blog coming soon! But for now, I hope you’ve enjoyed seeing what we did, where we stayed, and what we wore! It was another trip for the books! Thank you to all of our sponsors and especially to Nina and Hotelito for such a LOVELY time! 2ND HALF?? ?ARE YOU KIDDING ME??? LOL It took me 45 minutes to read and look up the fabulous content you offered!!! WOWZA!!! Your legs are amazing! What is your secret for staying so fit?